Oh Aude, you little scoundrel. Looks like she'd been subjected to an...Aude-it! Never underestimate people with masks in video games Aude, never. There is a clearly Aude-ible change of tone on that last panel, me thinks. 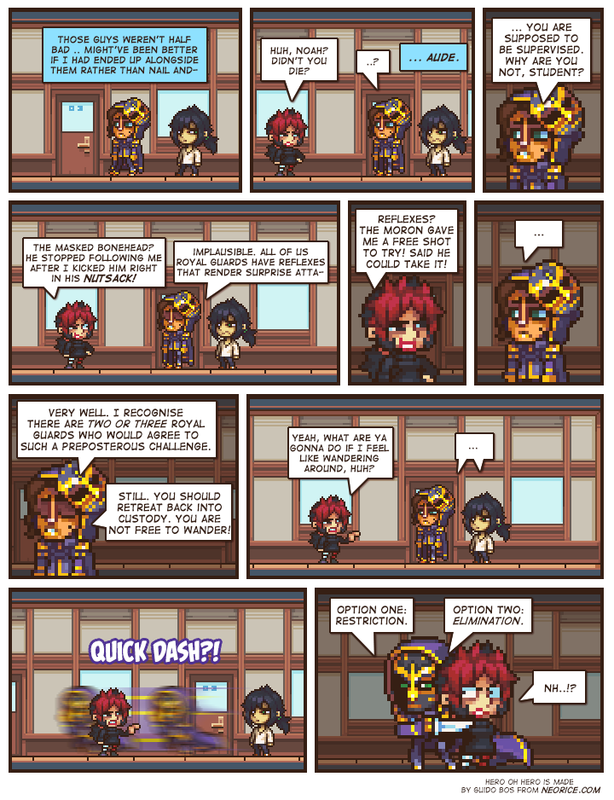 Royal Guard used Quick Dash! A Royal Guard or two that would let Aude go for it? Geez, talk about low hiring standards. Oh, and the Royal Guard ninja-blinking behind her, putting the mask on, and placing a knife on her throat? Yeah, that's legit. Theory: the masks give them powers! Wait, is the gaurd male or female? I can't tell. Hang on, how is "Aude" pronounced? I was thinking /ay=yude/ or is it just /ord/ ? I can't wait for Burk to face off with one of these guys. I HOPE burk faces off with them. You know it's gonna be awesome. Unless Burk isn't as strong as I think.